Most youngsters take playgrounds for granted. Unless they are handicapped and unable to swing on the swings, take a spin on a merry-go-round or zip down a slide. That may not be the case for long in Beeville. Some Moreno Junior High School students involved in the Joe Barnhart Academy are intent on seeing that any kid can have fun at a playground. That effort seems to be headed toward success now that the Beeville Economic Improvement Corporation board of directors has approved the use of 4B sales tax funds to start a playground project designed for children who fall under the Americans With Disabilities Act. A Barnhart Academy team member, Instructional Consultant Nneka McGee, said two eighth-graders in one of her classes came up with the idea over the summer. 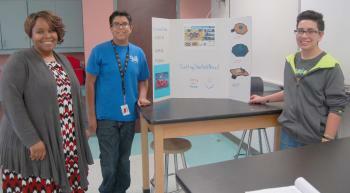 The two 13-year-olds, Lucas Ortiz and Elijah Flores, were taking part in a Give Back 2 Beeville Pitchfest, in which they explored the community and discovered ways to give back to others. The students were to come up with a “pitch,” a short speech or presentation designed to encourage support for an idea or project. McGee said the Barnhart Academy provides a learning environment for students who are interested in science, technology, engineering, art and mathematics with project-based learning. Ortiz and Flores came up with the idea of a project called “ABLE.” The letters stand for A Better Life Experience. Ortiz said he got the idea of providing ADA compatible playground equipment so his nephew would be able to play on a real playground just like other kids. Ortiz’s nephew is in a wheelchair and cannot play on regular playground equipment. Because the nephew lives close to Kohler Park, across the street from R.A. Hall Elementary School, Ortiz and Flores decided the park would be the ideal spot for some ADA playground equipment. The students started doing their research and found that Little Tikes Commercial, an innovative playground equipment company, offered designs that were ADA compatible. It just so happened that the City of Beeville was about to apply for a Texas Parks and Wildlife Department grant to finance improvements at that particular facility and the staff was considering the installation of some ADA approved playground equipment. Beeville Main Street Director Michelle Clark-Treviño quickly became involved with the two Barnhart Academy students and she steered them toward the City Council to seek their approval. The boys went before the council in October, joined by McGee, and supported by Treviño. After their presentation to the council, Treviño suggested that the boys approach the BEIC board to see if they could get some 4B sales tax money from the city’s quality of life budget. By the time Ortiz and Flores made their appearance at the BEIC board meeting, several girls involved in the Barnhart Academy had joined the effort. At the board meeting, Salma Manzano, Kastasya Encinias, Lucie Ruiz and Ty Hernandez were the ones making the presentation. The students told board members that the cost of the entire project was, at first, estimated to be about $165,000. That would include an entire playscape and even a lemonade stand with connecting ramps. The company explained that the project could be done in stages and the sales staff recommended starting with one component of a system. The students said that would consist of the installation of a Revolution Inclusive Spinner. The device is like a merry-go-round that can be ridden by children in wheelchairs and who have other handicaps. “It could be finished by next summer,” Ortiz said. The cost of the entire package for the spinner, including a special mat that would be installed under the equipment, would run $22,551.22. When Ortiz and Flores explained their plan to the BEIC board, one member, Daryl Martin, immediately expressed his support. Several girls involved in the project had joined Ortiz and Flores. “I’m familiar with the Barnhart Academy program,” Martin said. He also said he supported the idea of providing ADA compliant playground equipment for the city’s parks. Treviño reminded the board that the 4B sales tax budget has $300,000 for quality of life projects. She also reminded the board that the city should be hearing about whether it would receive the grant around March 2018. One piece of playground equipment that the city had proposed for the project would be a swing set with eight swings that could be used by children with different types of disabilities. When the board voted on the request, every member was for awarding the full amount for the $22,551.22 spinner. Martin abstained from the vote. The City Council will have the final say regarding the awarding of the grant. However, the project is one that council members are certain to approve. “The plans are to get the spinner done and then go from there,” McGee said. “It’s been a lot of work but it’s worth it,” Ortiz said of the project.